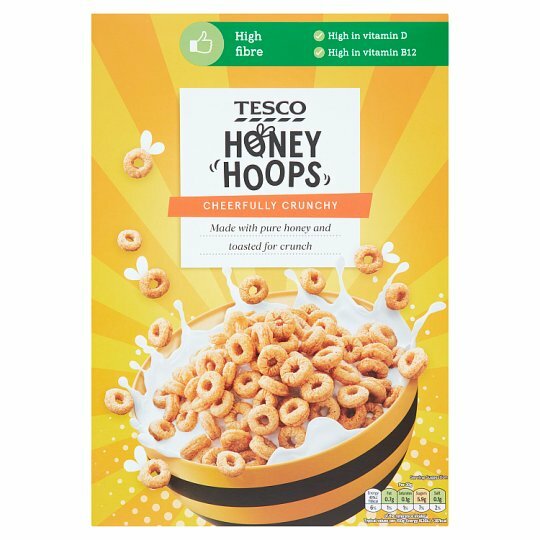 Oat and wheat cereal, coated with honey and sugar, fortified with vitamins and iron. INGREDIENTS: Oat Flour, Wheat Flour [Wheat Flour, Calcium Carbonate, Iron, Niacin, Thiamin], Sugar, Wheat Starch, Maltodextrin, Blended Honey (3%), Raising Agents (Potassium Bicarbonate, Sodium Bicarbonate), Salt, Flavourings, Colour (Paprika Extract), Niacin, Iron, Riboflavin, Thiamin, Vitamin D.
May contain milk. For allergens, including cereals containing gluten, see ingredients in bold. Store in a cool, dry, odour free place., To retain freshness, fold over inner bag after use.